At our Huntington Beach dental office our expert dental team can skillfully employ veneers as a choice to create a long lasting, and natural smile. Veneers are a thin yet resilient material that’s layered over a tooth, in order to protect a damaged tooth or improve its aesthetics. Veneers are made up of either porcelain or composite shells which cover the full surface of your teeth. Long lasting and designed to create a natural smile, veneers are an excellent choice to hide chips or gaps, discolored teeth or other dental imperfections like worn enamel. They’re fast, simple to use, and will help you create an effective solution for a beautiful and long last smile. Not long ago, crowns were the only reasonable option for the correction of damaged teeth. With veneers, a new and non-invasive treatment is now available. 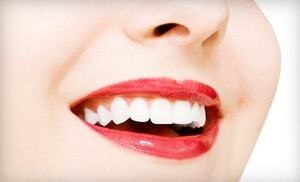 Cost effective and quickly placed, veneers create attractive smiles easily. Getting veneers requires one or two visits. There is little anesthesia involved with the procedure. The teeth are prepared through a light buffing and sanding process. This allows the teeth to accommodate the thickness that the veneers carry. An impression of the teeth is taken, which will involve a mold designed and analyzed by the dentists. You can choose the shade of veneers, though most patients want the natural looking and brightest color. If you are looking to improve the aesthetic features of your teeth and enjoy a whiter, more uniform and attractive smile, veneers present the finest choice for treatment. Our skilled dental group offers a choice of porcelain and composite resin. Many patients will choose our porcelain veneers, which mimic a patient’s natural tooth surface. All veneers work seamlessly to provide restorative dental work as well as offering beautiful cosmetic enhancement. If a patient has with chipped or cracked teeth, or if he or she needs a more ideal smile, veneers work perfectly every time. We’re ready to assist you with the application of veneers as the solution to dental issues.